Includes: exfoliation and light massage with silky body cream. Cleanses, softens and rejuvenates the skin. A relaxing, cleansing and nourishing treatment that also stimulates circulation. Includes exfoliation, mud mask and body lotion. Shins 45 €, shins & thighs 50 €. A gentle massage of the neck, shoulders, upper back, upper arms, scalp, face and ears. The treatment releases tension, improves the condition of the hair and relieves stress-related symptoms such as headache and eyestrain. Lymphatic drainage facial ia a gentle massage that targets the lymph-nodes and drains toxins. It combat puffiness and infuses a little glow. Chocolate massage combines a gentle massage with the luxurious scent of chocolate. It is a nourishing and healthful treatment for the body as well as for the mind and soul. 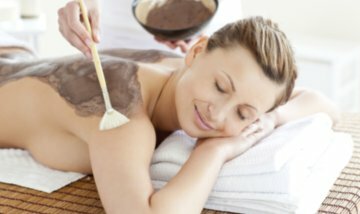 The enjoyable massage with warm chocolate oil helps relaxation, softens and soothes the skin, relieves daily tension, lifts the spirit and stimulates feelings of happiness. Exfoliation removes dried skin cells and improves blood circulation. Cocoa-based oil softens and soothes the skin, helps relaxation and stimulates feelings of happiness. Relieves muscular tension and increases metabolism. A full-body massage with natural essential oils that gently soothes both the body and mind. 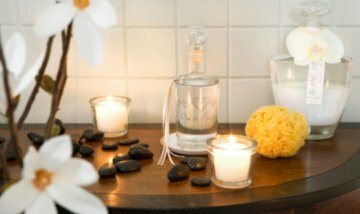 Aromatherapy massage provides good results especially in the treatment of stress, metabolic problems, hormonal imbalances and cold symptoms. 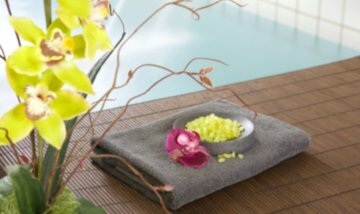 A versatile, pampering treatment that begins with bathing in specifically-selected flower essence water while enjoying a drink of juice or herbal tea. After the bath the skin is washed with natural yoghurt to make it fresh and velvety soft. The treatment is finished with a gentle, conditioning full-body aromatherapy massage using scented therapeutic oils selected for the customer’s needs. The effect and absorption of the therapeutic oil is enhanced by exfoliation and gentle lymphatic drainage that stimulates the lymphatic and micro-blood circulation. Cellulite and small accumulations of fat are reduced. The blood circulation is stimulated, the metabolic rate is increased, and the skin is regenerated and firmed. Lotus -body oil massage with the final relaxation with energy stones. Massage refreshes and fires. The effect and absorption of the therapeutic oil is enhanced by gentle lymphatic drainage and exfoliation that stimulate the lymphatic circulation and micro-blood circulation. Cellulite and small accumulations of fat are reduced. The blood circulation is stimulated, the metabolic rate is increased, and the skin is regenerated and firmed. Coconut oil smells lovely and is an excellent moisturizer for the skin. Also suitable for the care of ageing skin. Full-body massage combining aromatic fragrances and meridian treatment performed with a rock-crystal massage ball and massage sticks. Revitalizes and detoxifies the body and boosts its energy levels. Also suitable for convalescents as well as for the alleviation of tension and blockages caused by stress.